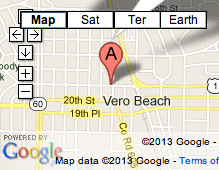 In Vero Beach during the first decade of the 1900's there was a tradition of naming buildings after Native Americans. The Pocahontas Arcade, built in 1923 by Blackford and Davis originally contained nine offices and a wrap around loggia. In 1926 a second story addition of 23 apartments was constructed. On the parapet, artist A.A. Thomas sculpted the life-size image of the Indian girl, Pocahontas. The Pocahontas Building was renovated in 2002 and 2003 by the Haggerty Family. Italian Kitchen, John Eisinger's Photography Shop, Bodega Blue Cafe, Swingsation Dance Studio, Dojo Karate School, His and Hers Beauty Salon, Vero Vacuum, Veteran's Realty and Coast to Coast Shutters. Be a viable part of a revitalized downtown! In the Historic District of Downtown Vero Beach. Across from the Pocahontas Park, the Community Center, the Heritage Center, and down the street from the city library, main post office and Indian River County Courthouse. Just two miles from the beaches! For further information contact Karen Haggerty by phone or email or in person upstairs in the lobby of the Pocahontas Building.